Want to Know Why You Get Neck & Shoulder Pain at Your Desk? Picture this: you’re typing furiously at your computer, working on an important deadline. You glance down at the clock and realise you have less than an hour to finish this and get it out. As you type, a familiar distraction starts to creep in. ‘Oh no, not now’ you think. It starts between your shoulder blades, like a dull ache, and moves up to a tired feeling in your shoulders. The last thing you need right now is your neck and shoulder pain to kick in. You try to adjust your posture, to sit up straight by pulling your shoulder blades together, but it’s no use. Within five minutes you’re slouching again, and you can feel the stiffness moving up to your neck. You rub your neck, roll your shoulders, and tilt your head while dropping your shoulder to stretch. For 30 seconds. And then it’s back to annoy (and distract) you, again. If this scenario sounds familiar to you, you’re one of the many, many, many desk-bound people who suffer with neck and shoulder pain. Call it what you will: a pain, an ache, a feeling of tiredness, an annoyance. At best, it’s a slight irritation, distracting you from your work during the day. At worst, you could wake up with a neck spasm and not be able to turn your head (and believe me, I’ve seen that walk into the clinic a number of times). Every second you stop and rub your neck counts when you’re working to a deadline. Around 30% of the complaints we see are neck/shoulder/desk-related. Most of the time, when someone walks in to see us those aches and pains have come and gone quite a few times. They’ve finally been forced to come in because this time it’s not going away. It’s affecting their work, and sometimes even their sleep, and they want to finally do something about it. But why? Why do so many people get neck and shoulder pain while working at a desk? If you’re already one of our clients, you know we’re big on client education. I believe you can’t really fix a problem if you don’t have at least some understanding of where it’s coming from. By the time you finish reading this, you’ll have a better understanding of a lot of the common mechanisms behind your discomfort, and therefore be better equipped to deal with it. When you understand why something’s happening, it’s much easier to understand what to do about it and how to address it. Once you’ve read the post, if you’d like some tips on how to start addressing your neck and shoulder pain, we have a free 3-step downloadable guide to help you get started. 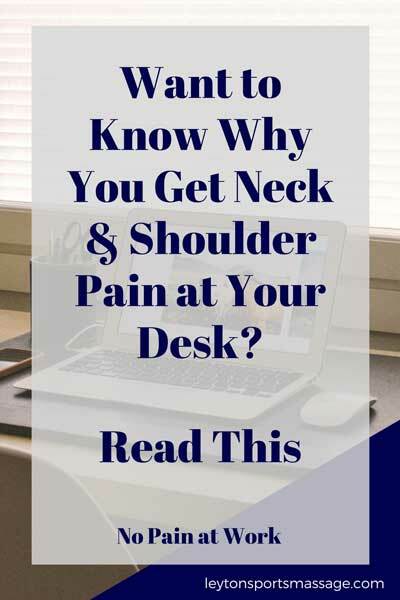 What causes neck and shoulder pain at a desk? If you do a quick google search on the causes of neck and shoulder pain, you’ll see the same thing ‘poor posture,’ ‘poor posture at a desk’, ‘muscle tension caused by poor posture’. Okay. Neck and shoulder pain is caused by neck and shoulder tension and poor posture. But why does poor posture cause neck and shoulder pain? What’s the process from Point A: Poor Posture to Point B: Neck and Shoulder Pain? And if good posture is so essential, why is it so hard to have good posture all the time? And why does poor posture create muscle tension? And why does it sometimes go away when you haven’t really done anything to address it, and why does it then come back again? I’ve been working with neck and shoulder pain for about eight years. To my knowledge, the questions I just asked don’t have a sound evidence-base (which means, double-blinded clinical trials) explanation. However, through working with hundreds of clients, myself and other massage therapists/bodyworkers rely on certain hypotheses to guide our work, which I’ll share with you today. The concepts that follow are mainly based on my own clinical experience, what helps and what doesn’t, and general working concepts in the field of soft tissue therapy. First, let’s talk about posture. Yes, it’s true, the number one cause for neck and shoulder pain from desk-work is poor posture. This probably doesn’t come as a surprise to you. Most of the people who come to see me are aware that their posture is at least one of the factors in their discomfort. If you imagine that our body is a structure of bones being held in place by muscle (which, on one level, is true), you can understand that there would be an ideal position for that structure to be in balance. In this ideal position, no one muscle or groups of muscles are overworking. It may feel like good posture is more work for your muscles than slouching. When we slouch, though, all sorts of muscles start to contract to try and stop us from moving further away from ideal alignment. It’s a subconscious thing – you don’t have to consciously remember to stop yourself from falling onto your keyboard. Your muscles do it naturally. 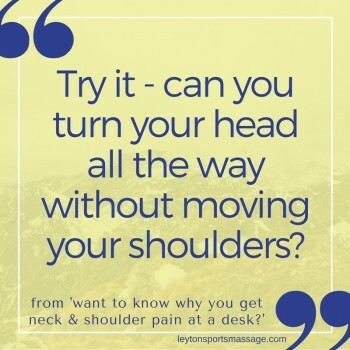 Every day that you’re at a desk, slightly hunched forward, muscles in your upper back and tops of the shoulder/back of the neck contract very gently to prevent you from falling further forward. Why does poor posture cause neck and shoulder pain? The four-word answer (or three – do hyphens count? ): muscle tension build-up. As you sit in this non-ideal posture over days, and weeks, and months, and years, the muscles very slowly, and on a day-to-day basis, imperceptibly get tighter and tighter. One day of poor posture is unlikely to create neck and shoulder pain. Years of it probably will. You won’t notice the tension build-up at first, because it’s in really small degrees and your body adapts. Our brain can only pay attention to so many things at once, and the muscle tension at first won’t be enough to get your brain’s attention. You’ll unconsciously start to twist your upper body instead of your neck to look behind you, or change the way that you put on your coat to avoid raising your arm to the point of restriction. Try it now: can you turn your head all the way to the right or left, without moving your shoulders? The tension in the muscles eventually builds up to a point where it starts to cause pain (or, in some cases, tension headaches). That line is different for different people – I’ve seen people with very little tension, or only one or two knots in the muscles in a lot of pain, and others who to my hands feel like they’ve been solid for years and only just started to notice some discomfort, and everything in between. Why is it so hard to have good posture? When you’re first developing, you naturally have good posture (look how straight 2-years old sit up when they’re playing). At some point, you start to slouch naturally. Maybe as a teenager? Muscles change over time, depending on the input. You probably already know this with weights or exercise. You start at Point A and in a few weeks you get stronger, or build endurance, or things become easier. This is because your muscles are changing with the input you’re providing. Guess what sitting at your desk in an imbalanced position is? When you slouch at a desk the muscles in the front of your chest and shoulders are in a shortened position, and over time those muscles will actually become shorter and tighter. The muscles in your back that would usually be used to keep you upright get weaker. So, by the time you realise you’ve built up some tension/pain in your upper body you have some muscles short and tight pulling you forward and the other muscles that should keep you up are too weak to pull against them. That’s why, by the time you notice you have neck and shoulder pain, it’s so hard to make the switch back to good posture. This is really common. I ask ‘how long have you had it’ and the client says ‘about a week’. Then I say ‘and have you had this before?’ and they say ‘oh, yeah, it’s come and gone before’. Hate to break it to you, but that’s how long you’ve had it. There are a few possible reasons why the aches and pains from desk sitting come and go. The main one is that you will invariably do some things that make your muscle tension slightly better and slightly worse, so it will go over the threshold where you start to feel it, then drop back down, only to come up again when you do things that will tighten it again. Like stressing out at your desk over a deadline (making the tension slightly worse). And then working out or having a brisk walk (movement loosens up muscles). The other factor is your brain can only pay attention to about 2-3 things at a time. Sometimes the tension/restriction/pain will be in the top three. Until, of course, it gets so tight that it just stays above the threshold and puts itself permanently in the top 3 until you do something about it. (Just wait until it feels better after you book your massage appointment – not had your massage yet. Just booked it). Neck and shoulder pain is usually caused by tension in the back and the top of the shoulders*. This tension has usually been building up for a long time but hasn’t been perceived because it wasn’t bad enough. The tension in those muscles is created by chronic imbalanced use, almost always from poor posture. Typical chronic poor posture creates short, tight muscles in the front of the body, long, tight muscles in some shoulder and neck muscles compensating for the imbalance, and some postural muscles become weak from underuse. This makes it hard for you to switch permanently to ‘good’ posture immediately. Now that you understand this, you can relax knowing that it takes a while to fix, because it took a while to build up. Many of my clients get frustrated because they try to fix themselves for a week, and keep getting pulled into bad posture and chronic tension, stiffness, or pain. You can definitely help your desk-related neck and shoulder pain, but you’ll need to be patient and give your body an amount of time that’s proportionate to how long it’s taken to build up. If it’s taken years to get there, it won’t take years to get rid of, but it may take a few weeks, or a few months. How long it takes also depends on how consistently you work on rebalancing your upper body and improving your posture, and how much external help you get (like, with specialised massage therapy, osteopathy, physio, or Pilates or yoga). If you’d like to get started on improving your posture right now, why not enrol in our free 7-day neck & shoulder pain minicourse? When you enrol, you’ll also receive some tips or further training on desk-related neck and shoulder pain. Click here to enrol in the free minicourse for neck and shoulder pain! Now I’d love to hear from you in the comments below: does this explanation make you feel like you understand your neck and shoulder pain a little better? Are there any other questions related to its cause that have come up, or you don’t see here? If you have any questions related to the cause of your neck and shoulder pain, leave them below and I’ll work on adding them to this post. *Not all neck and shoulder pain is created by muscle tension. While it is by far the most common cause of neck and shoulder pain I see, if you are having any aches or pains that you’re worrying about, you should consult a healthcare practitioner so they can assess/diagnose your specific case, in case your pain is caused by something more serious. This article is intended for educational purposes only, and shouldn’t be taken as personalised medical advice or diagnosis.